Discover Egypt’s treasure trove during this 9-day tour. Start in Cairo with the Pyramids, the Sphinx and the world-famous Egyptian Museum of Antiquities before flying on to Luxor for a 5-day cruise up the Nile. Marvel at Luxor and Karnak’s magnificent temples, visit the Valley of the Kings and Queens and sail in comfort up river to visit the temples at Edfu and Kom Ombo before reaching Aswan, the playground of locals and internationals. Optional excursions include a fly-in tour to Abu Simbel and a day-trip to Alexandria. On arrival we meet and transfer you to the hotel. Balance of day is at leisure. 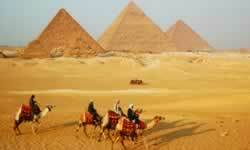 Today we visit the Great Pyramids, the Sphinx, Memphis and Sakkara. 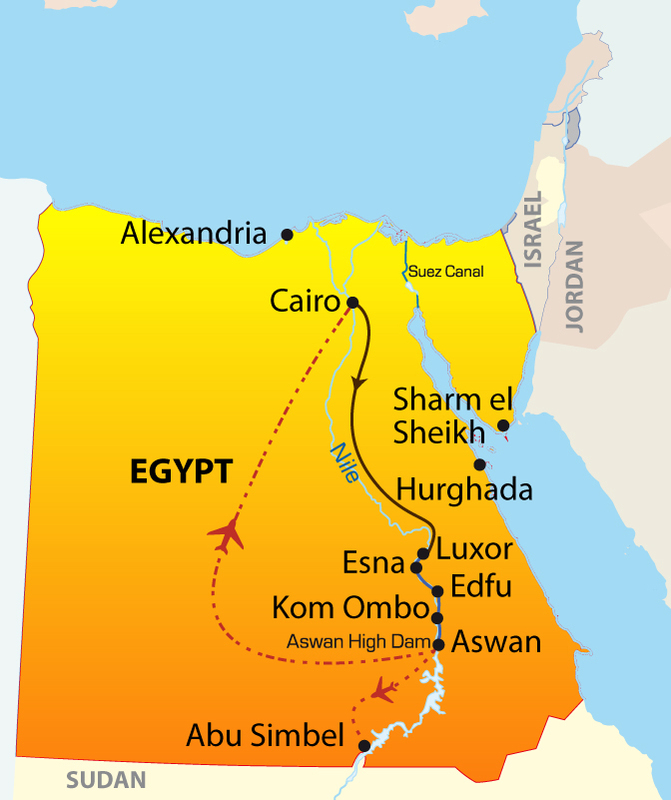 We depart early on a short flight to Luxor to board our Nile Cruise ship. This afternoon, visit the famed temples of Karnak and Luxor. We cross to the West Bank to “Thebes” to explore the Valley of the Kings and Queens, the temple of Hatshepsut and the Colossi of Memnon. In the afternoon we sail to Esna. Tonight enjoy the Captain’s welcome cocktail party. On arrival in Edfu, board a ‘caleche’ to take this horse-drawn carriage to the Temple of Horus. Afterwards we sail to Kom Ombo to the Temple of Sobek, the Crocodile God. of Aswan’s High Dam, the Ancient Granite Quarries and the Temple of Philae. This afternoon board a felucca and sail around Elephantine Island. Tonight enjoy a fabulous Nubian folkloric show. Disembark and transfer to the airport for a flight to Cairo where we transfer you to the hotel. Or, before flying to Cairo take an optional excursion by air to Abu Simbel. Tonight’s overnight is in Cairo. Today visit the Egyptian Museum of Antiquities, Old Cairo, Hanging Church, Ben Ezra synagogue, Citadel, Mohamed Ali Mosque and Bazzaar. PER PERSON SHARING (2-4 pax) Shepheard Hotel & Swiss Inn Radamis 1 Nile Cruise. Rate includes domestic airfare (CAI-LXR-ASW-CAI).